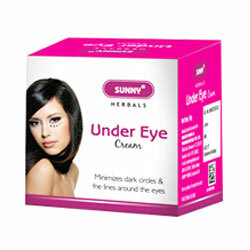 Bakson's Sunny Herbals Under Eye Cream Reduce puffiness, minimizes dark circles & fine lines around the eyes. Minimizes dark circles and fine lines around the eyes. Enriched with the goodness of essential oils, Aloevera, Arnica and Cucumber extracts, it revitalizes the skin around the eyes, making it appear brighter and smoother. It reduces puffiness, minimizes dark circles & fine lines around the eyes, nourishes the skin & gives it a fresh look. Take a small, pea size amount of the cream & rub it onto your skin around the eyes using circular motion. Massage it for about 5 mins. & leave for sometime. Apply twice daily.